Home > TVHS News > Say Boo to the Flu! 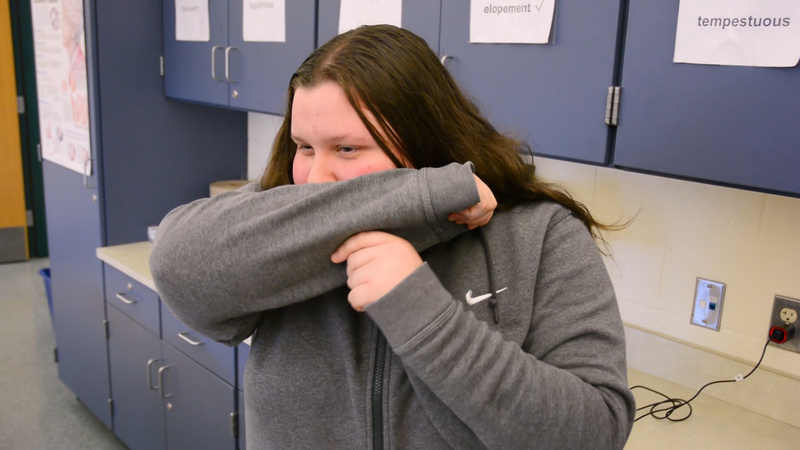 Flu season is upon us once again, so School Nurse Mrs. Whelan shares some common questions about the Flu and how you can protect yourself and your family. Flu illness can vary from mild to severe. While the flu can be serious even in people who are otherwise healthy, it can be especially dangerous for young children and children of any age who have certain long-term health conditions, including asthma (even mild or controlled), neurological and neurodevelopmental conditions, chronic lung disease, heart disease, blood disorders, endocrine disorders (such as diabetes), kidney, liver, and metabolic disorders, and weakened immune systems due to disease or medication. Fever, cough, sore throat, runny or stuffy nose, body aches, headache, chills, fatigue and sometimes vomiting and diarrhea (more common in children than adults). Some people with the flu may not have a fever. People with the flu may be able to infect others from 1 day before getting sick to 5 to 7 days after. However, children and people with weakened immune systems can infect others for longer periods of time, especially if they still have symptoms. To protect against the flu, the first and most important thing you can do is to get a flu vaccine for yourself and your child. Vaccination is recommended for everyone 6 months and older. It’s especially important that young children and children with long-term health conditions get vaccinated. The flu vaccine is updated annually to protect against the flu viruses that research indicates are most likely to cause illness during the upcoming flu season. Flu vaccines are made using strict safety and production measures. Over the years, millions of flu vaccines have been given in the United States with a very good safety record. If your child is sick with flu illness, try to keep him or her in a separate room from others in the household, if possible. CDC recommends that your sick child stay home for at least 24 hours after his or her fever is gone, except to get medical care or for other necessities. The fever should be gone without the use of a fever-reducing medicine. Cover your mouth and nose with a tissue when you cough or sneeze. Throw the tissue in the trash after it has been used. Clean and disinfect hard surfaces and objects that may be contaminated with germs including bathroom surfaces, kitchen counters and doorknobs. . Clean by wiping them down with a household disinfectant according to directions on the product label. These everyday steps are a good way to reduce your chances of getting sick. However, a yearly flu vaccine is the best protection against flu illness. Talk to your doctor early if you are worried about your child’s illness. Make sure your child gets plenty of rest and drinks enough fluids. If your child is 5 years and older and does not have other health problems and gets flu symptoms, including a fever and/or cough, consult your doctor as needed. Children with certain chronic conditions, including asthma, diabetes and disorders of the brain or nervous system, are at high risk of serious flu-related complications. If your child is at high risk for flu complications, call your doctor or take them to the doctor right away if they develop flu symptoms. No. Your child should stay home to rest and to avoid giving the flu to others. Keep your child home from school, daycare or camp for at least 24 hours after their fever is gone. (The fever should be gone without the use of a fever-reducing medicine.) A fever is defined as 100°F (37.8°C) or higher.